The MSC Wiley Lecture Series broadens the educational experiences of the Texas A&M community by providing thought-provoking programming on national and foreign policy issues. The current Secretary of State, Mike Pompeo, will be speaking at Texas A&M University. 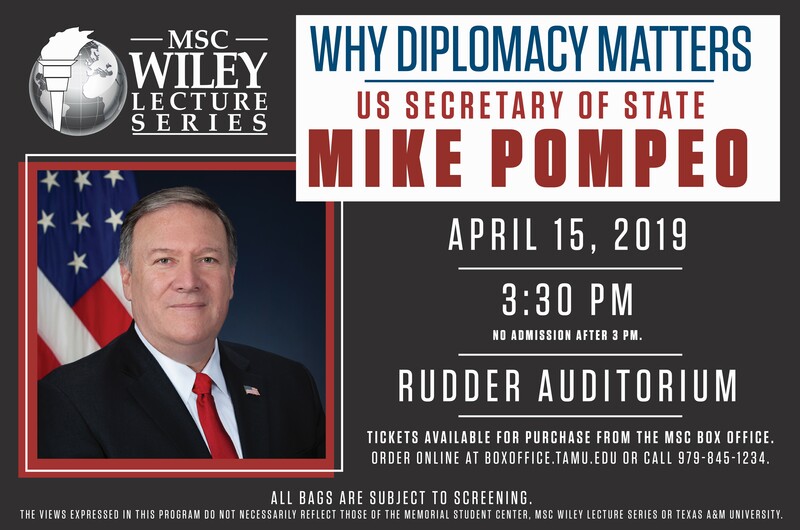 On Monday, April 15th, please join the MSC Wiley Lecture Series for a presentation by Mike Pompeo, who will be discussing “Why Diplomacy Matters”. Following his remarks, the Secretary of State will be partaking in a Q&A session. Questions can be submitted through our form and will be screened. The program will begin at 3:30 PM in Rudder Auditorium. Doors will close at 3:00 PM. Tickets are $10 for any student with a student ID and $15 for general admission. Tickets available at the MSC Box Office. Please do not bring bags to the program. If you are in need of ADA accommodations, please call (979) 845-1234 for assistance. Please allow five business days to accommodate all requests. The MSC Wiley Lecture Series is a showcase of distinguished public policy leaders discussing issues relevant to our global society. MSC Wiley hosts symposia throughout the year showcasing academics, culminating in the annual spring Main Program, featuring world renowned leaders. Share your expertise with the campus community and help our students develop into the leaders of tomorrow. Contact wiley@msc.tamu.edu for information on future collaborations.